DIY Natural Lip Balm Recipes & Guide: Homemade Lip Lifesaver! Home | DIY | DIY Natural Lip Balm Recipes & Guide: Homemade Lip Lifesaver! 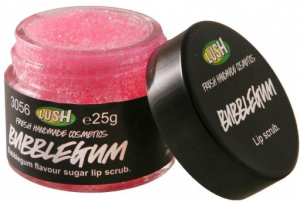 So why would you want to make your own lip balm? 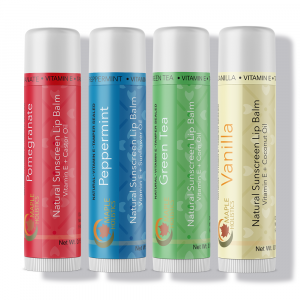 Maybe you’re looking to get away from all the toxic chemicals added to commercial lip balms. Maybe you want to save a couple bucks or a trip to the store. Or maybe you’re just looking for a fun activity to do at your daughter’s birthday party. Whatever your reason is, you will love the finished products of these DIY lip balm recipes! Let’s get started! Besides for being fun and cheap, homemade lip balm is much safer, and much more effective, than commercially produced lip balms. Ever wonder why you need to keep fishing around in your purse every few hours to find your lip balm, because your lips feel dry again? If the the lip balm is working, why do your lips still feel dry all the time? Ever wondered that? DIY lip balm promotes lip health. The truth is that chemicals in the lip balm such as camphor, menthol and phenol all make your lips feel nice and refreshed right when you apply it, but actually dry out your lips even more after the initial moist feeling goes away. Many lip balms also contain alcohol, which dries out very fast, and salicylic acid, which helps flake of the dry skin, but unfortunately leaves brand new dry skin in its place. With a lip balm you need something that will actually soak in and moisturize your lips, while most commercial lip balms simply put a nice moist layer over the surface of your lips. This nice-feeling layer simply sits there and exacerbates the problem by drying out the lips that it’s covering. It blocks the lip’s access to the natural moisture that it would absorb from the environment. I really only have time to scrape the surface with this, but just look at the ingredient list on your favorite lip balm and you’ll find tons of unnatural waxes, thickening agents, preservatives, synthetic dyes, plastics, and all sorts of chemical flavoring and fragrances. Many of these substances are even known to be damaging to lips and skin. However, the makeup companies still use them since they are cheap, and make their products more luscious without caring if they are actually achieving the desired end result of healthy lips. Remember, just because the FDA approved that you can put these compounds on your lips, doesn’t mean that you should put them on your lips. Many people are waking up to realize that if they wouldn’t put it in their body, they shouldn’t put it on their body. Even though a tiny amount of chemicals applied to your lips once in awhile will probably have zero negative effects, years and years of regular application of known toxic substances to your skin (lips are skin too) can have a very potentially damaging outcome in the long run. 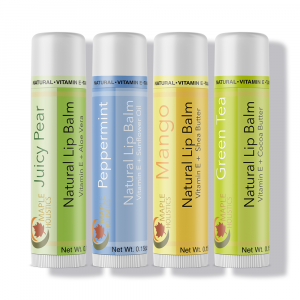 Ready to try avoiding all of these problems and making your own natural lip balm? Grab your apron and let’s start cooking! 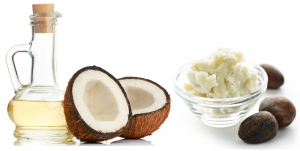 Coconut oil & Shea butter for DIY lip balm. In this recipe, we are going to use: Beeswax, for its emollient (moisturizing) properties and balmy texture. Coconut oil, for its deep moisturizing abilities. Shea butter, as an emollient, as well as for it’s vitamin A and E content to help fight the free radicals that cause damaged lips. Finally, a few drops of essential oils, for flavor, scent and added health benefits. 5-15 Drops Peppermint Essential Oil. Grate the beeswax until you have 1 tbsp. Keep in mind that your grater will be very difficult to clean after, so don’t use the grater that you need for dinner tonight. Heat up the water in the double boiler. If using a saucepan, heat up the water and place the glass bowl on top of the water, making sure no water gets in the bowl. Add the beeswax to the top of the double boiler, or into the glass bowl. When the beeswax is half melted, add the shea butter and coconut oil, and stir until completely melted. Turn off the flame, let the oil cool slightly for a few short minutes, and stir in the peppermint oil while the mixture is still plenty hot and liquidy (extreme heat ruins the essential oil and makes it spoil faster, so you just want to make sure the mixture isn’t too hot when it’s added). Pour the mixture into your containers, and let cool for a few hours. You can put it in the fridge if you can’t wait and want to speed this up. Use as needed and feel great! You can always remelt this mixture and add more essential oils, so best err on the side of too little over too much. A great idea is to put a drop or two of your melted lip balm on some wax paper, and cool that quickly in the fridge to see how that feels and smells for you. Then, adjust your mixture accordingly before pouring it into the containers. For extra fun and flavor, add things like a drop of raw honey, a little vanilla, or even some cocoa powder! You can also infuse herbs in the mixture, such as hibiscus for added color, or rose petals for some classy aroma and elegance. Many people use a tiny drop of lipstick or natural food coloring to give it some color pop too. Be creative! Use the above formula as a base and go from there. You can also melt everything in the microwave if you’re not looking for so many extra dishes to wash.
You’re lip balm may melt a little bit in your purse on a hot day, so make sure that your container seals well so it won’t leak out, or keep it a little plastic bag. This balm also works great for chapped hands, especially in the winter time! There are several reasons you may want to avoid beeswax in lip balm. Some people have an allergic reaction to the propolis that gets mixed in when the bees are making the wax, and some are sensitive to the pollen, which is can be highly prevalent in beeswax produced during the spring. It is also possible to develop a sensitivity to beeswax when used regularly for long periods of time. Some vegans also simply don’t use beeswax. In any case, here’s an easy way to make your own lip balm without beeswax. 3 Tbsp Oil Of Choice. 5-10 Drops Essential Oil Of Choice. Heat up the water in the double boiler or sauce pan and bring to a low boil (if using a saucepan, place the glass bowl on top of the water after it has boiled). Melt in your liquid oil, Candellila wax, and shea butter over low heat until completely liquified and blended. Add in the essential oils if desired, or leave them out for a scentless balm. Pour into your containers and let them harden for several hours. It’s that simple! Use the tips and tricks above to really personalize the scent, flavor, and color to create a super personalized lip balm. For storing your homemade lip balm, you can be just as creative as you are when you’re cooking it up. The easiest way is to simply store it in your old lip balm tubes or an empty EOS Lip Balm sphere container (check out our EOS Review today). If you’re making a bunch, or can’t seem to find your old lip balms because you switched purses one too many times last month, you can use an empty Altoids container or mints tin, or buy cute little plastic containers from any art and crafts store. You can find containers in standard circle shapes, as well as in hearts, stars, and everything in between. If you’re giving it as a gift, you can personalize the outside with decorative tape, stickers, glue and glitter, personalized monograms, or whatever comes into your creative DIY mind. I personally think this is a great party favor idea to decorate with the initials of the guests, the birthday girl, the new couple, or the new whatever you’re celebrating…just have fun with it! If you’re now sold on the idea of making your own makeup, you can literally fill an entire shopping mall with options and variations for DIY lip products. You could do a lip scrub with brown sugar and a drop of honey and vanilla. You could do a lip gloss by copying the lip balm recipe and going a little lighter on the wax and a little heavier on the oil. You could do a lipstick by mixing equal parts beeswax, coconut oil, and shea butter, and color it with beet root powder or natural food colorings. And if you’re looking for plumper lips, you could do something with almond oil and cinnamon essential oil. The possibilities really are endless, especially when you start crafting your very own personalized flavors. I’ve even some across a few recipes that call for chocolate chips! More Maple Holistics DIY Natural Features: DIY Bath Bombs – DIY Face Mask – DIY Avocado Face Mask – DIY Shampoo Bar – Argan Oil Face Mask. So there you have it, a bunch of new ideas to keep yourself busy concocting the perfect lip balm blend. Have fun with it, you really can’t go wrong, and it’s a great little gift to give away since you probably don’t need 8 new tubes of lip balm anyways. 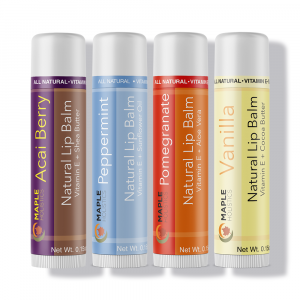 It’s safer than commercial lip balms, more effective, and much cheaper. Next Sunday, instead of heading to the mall with your friends to browse through the entire MAC store again for the fourth week in a row, why not try hanging out and having fun while experimenting with making your own homemade competitor versions! In fact, I think I’m gonna call up my little sister right now and tell her I solved her boring birthday party problem – so far all she has planned is the vegan, gluten-free cake.